High product throughput, damaged barcodes and different alignments: the in-counter scanner Magellan 3500HSi meets all retail challenges head-on. Its powerful imager captures 1D and 2D barcodes, from smartphones or tablet displays, too. With an optional upgrade it also captures digital watermarks, so-called »Digimarc« barcodes. Thanks to its high speed, the Magellan 3500HSi pays for itself in no time, particularly at the highly-frequented POS. Besides barcodes it also captures images and documents. The soft, adaptive lighting of the Magellan 3500HSi ensures for a higher degree of user comfort, without compromising on precision and speed. Just as comfortable for workers is the confirmation of good scans, which are either made optically via LED or acoustically via an integrated scanner. To connect further handheld scanners there is an RS232 port available; for a software update a USB and a microSD slot. Via OPOS, JavaPOS or Toshiba Remote Management it may also be managed remotely. 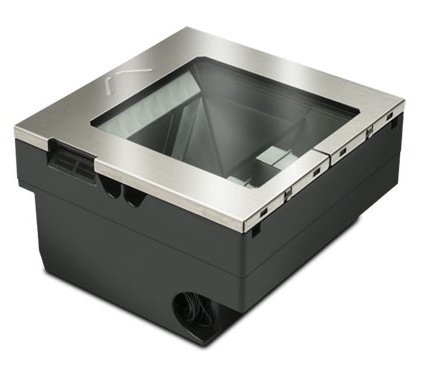 Robust stainless steel housing and a lack of moving parts ensure for a long life cycle – which is additionally supported by the 3-year manufacturer's warranty. The Magellan™ 3500HSi series of scanners continue the Datalogic tradition of high performance imaging for the high-volume point-of-sale. By duplicating the speed and large field-of-view of laser scanners and expanding the capabilities of imaging, the 3500HSi scanners provide outstanding performance on hard-to-read bar codes and seamless reading of a wide variety of bar codes. This Magellan scanner enables both high speed sweep and presentation scanning techniques ensuring maximum productivity and ergonomic ease, even with truncated (shortened), out-of-spec or poorly printed codes. • EASEOFCARE Service Plans offer a wide range of service options to protect your investment, ensuring maximum productivity and ROI.